Our evening at the new establishment started with the Burnt Corn ($11). 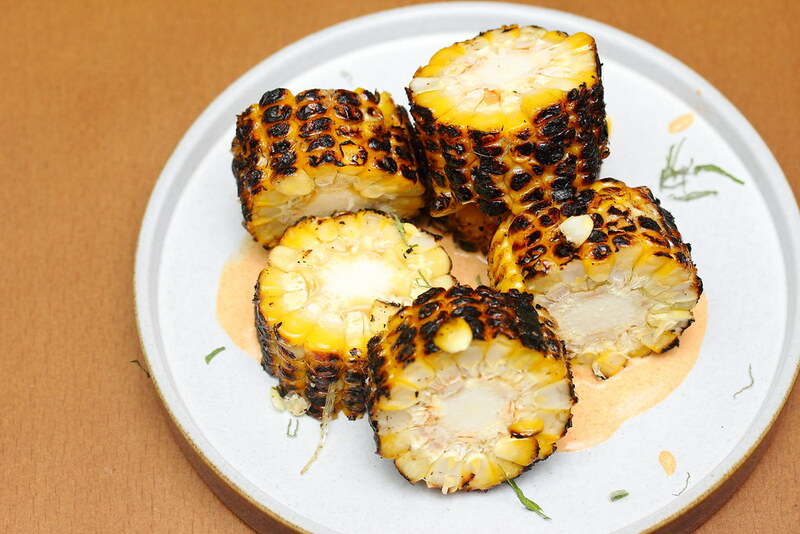 The bio-corn is rubbed with salt and lemon, oregano and served with sour cream. 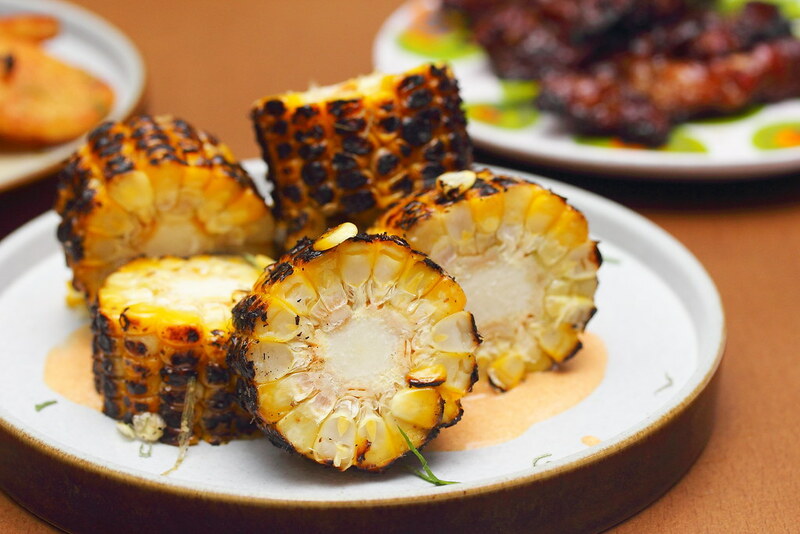 Aligned with Chef Sam's culinary philosophy - No Burn No Taste, the overly charred corn turned out to be very flavourful. 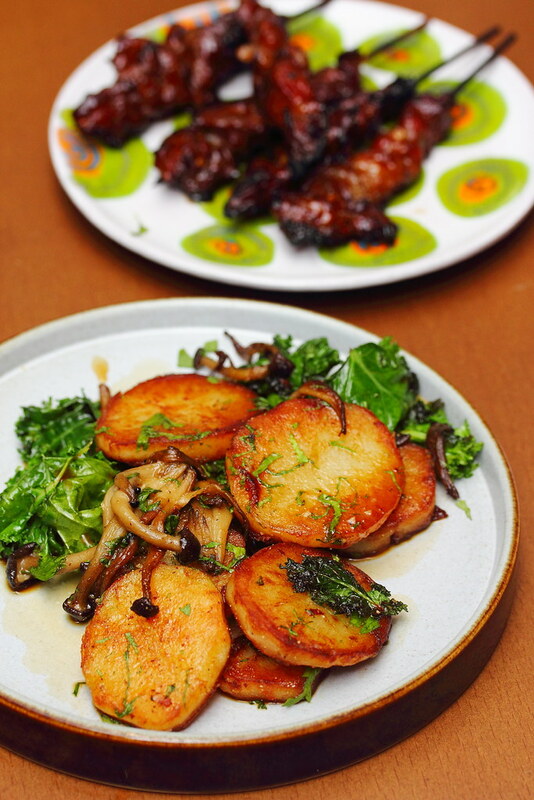 Boosting the Roasted Potatoes and Mushroom ($12) is the coat of lamb fat over the starch. This is accompanied with honshimeiji mushrooms, kale and garlic. Another delightful item on the menu is the Sataytay ($12) which uses Iberico pork collar that is marinated in sambal for a whole full day to develop the flavour. On top of the flavoursome meat, it was tender and juicy too. 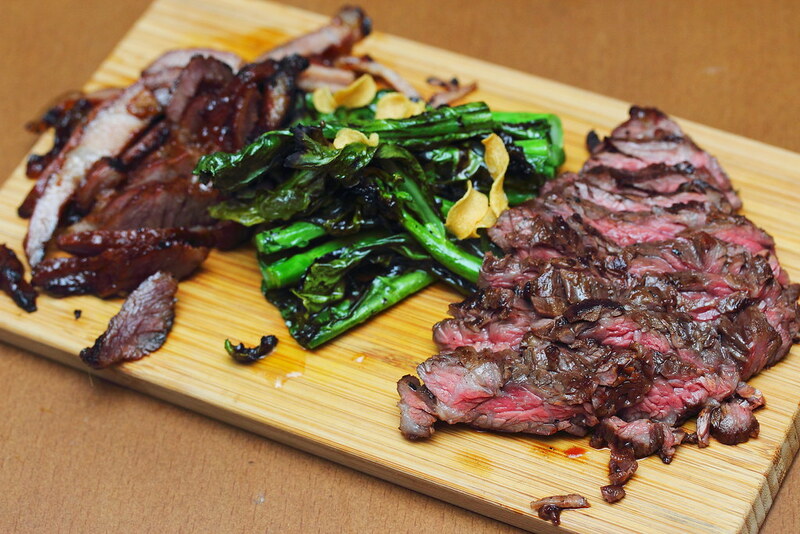 Chef Sam's Grilled Mangalicia Pork Collar ($24) is a Thai inspired dish. 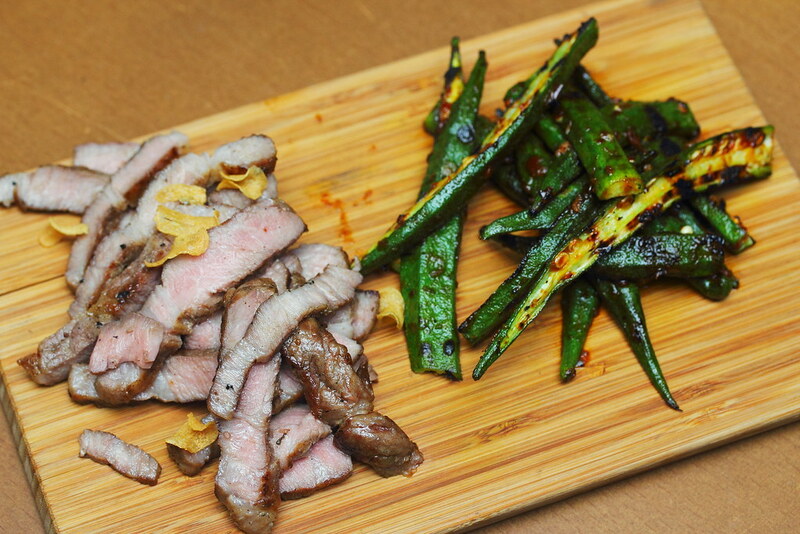 The pork collar is only seasoned with salt and grilled to a nice smokey scent, The other highlight on the board is the lightly charred sambal okra. The used of local spices to grill the okra reminds me of our sambal bbq fish. The Duh Meat Boat ($28) demonstrates Chef Sam's culinary skill in grilling perfectly. The wagyu skirt is grilled in low heat to get that slow caramelisation while retaining the succulence of the meat. On the other hand, the pork collar which is marinated in sambal and seasoned in salt, is grilled in high heat for the charred and smokiness. Even the accompanying kailan grilled for a different appreciation of the earthy green. The Ikan Bakar ($28) is like the Asian version of Fish & Chips. 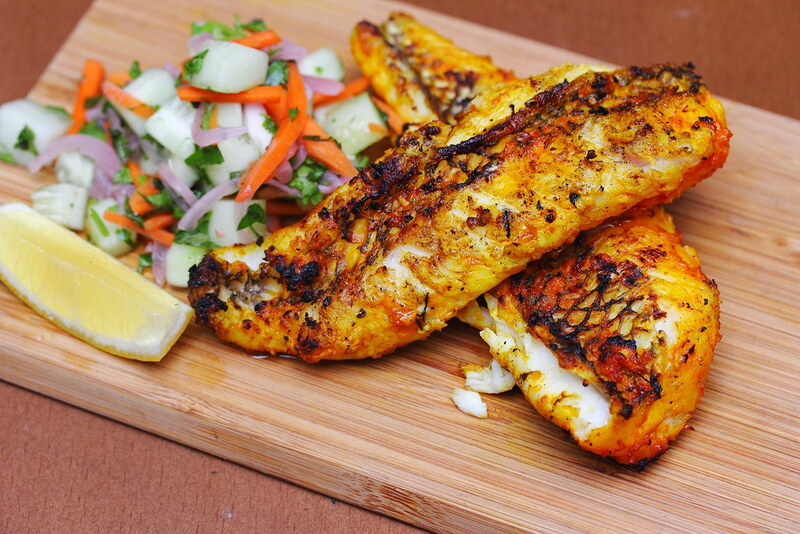 The line caught parrot fish is marinated with chilli, garlic, lemon juice, Kashmiri chilli powder and grilled in high heat. The result is a moist fish with the beautiful aroma that is pleasing to both the taste and scent. The cucumber achar side provided the needed acidity to freshen up the palate. 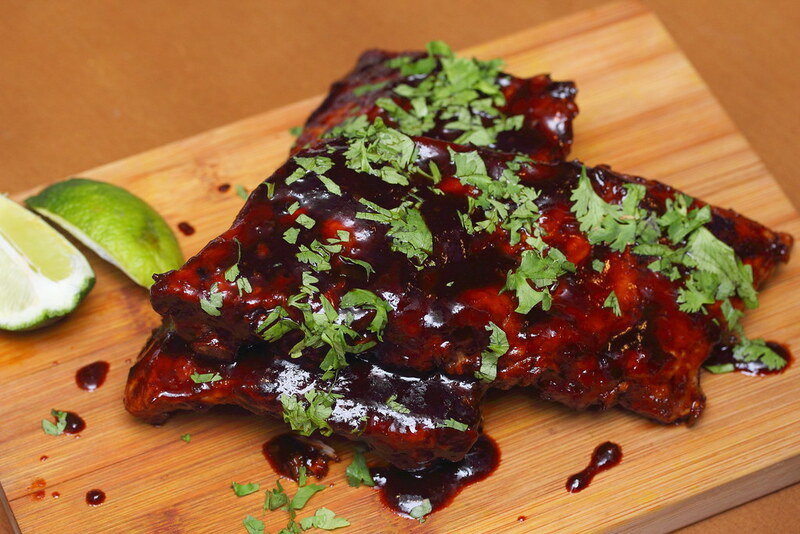 The Spicy BBQ Full Rack Pork Ribs ($28) will be loved by carnivores for the fall off the bone meat. The spicy sauce which made up of chipotle, kechap manis, rice wine vinegar is kind of unique. It is a new taste to me and took a while to register my preference. 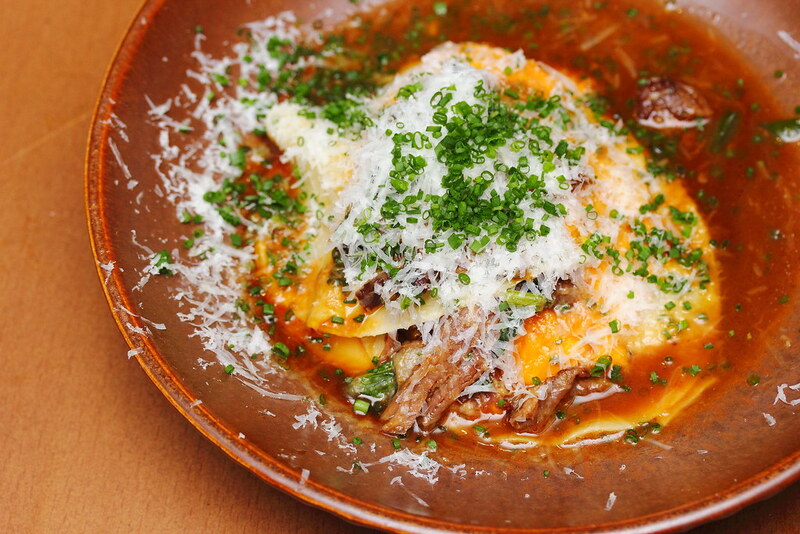 I actually have tried the Open Beef Ravioli ($22) when Chef Sam was at Raven. Back then I mentioned that the flavours and textures were on the note. However like a foreign song, I moved with the music but did not understand the lyrics. This time round, Chef Sam managed to sing to me in the dish and I could fully appreciate the whole concept and execution. 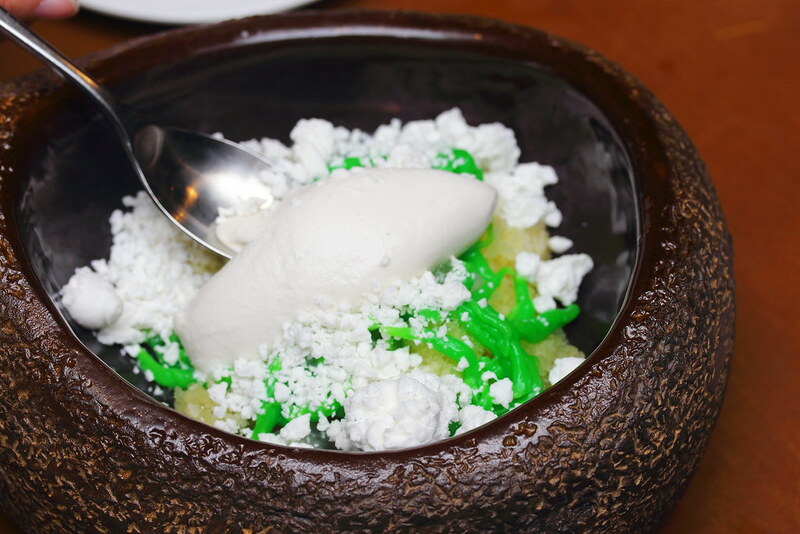 Moving on to dessert, we started with the Pineapple and Coconut Ice Kachang ($14). The refreshing combination of pineapple and coconut is very pleasing to the palate. I actually thought it resembles the local chendol dessert instead of the ice kachang as the name of the dish suggested. Another refreshing dessert on the menu is the Berries & Chocolate ($16). 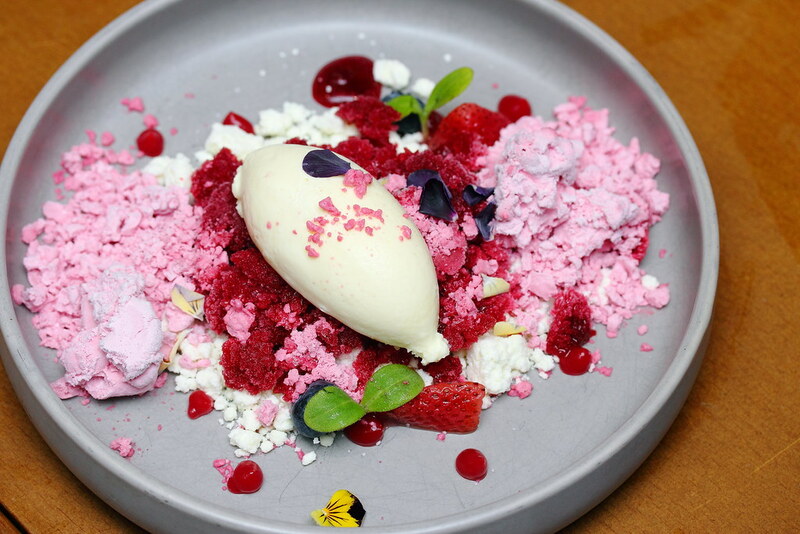 The fruity dessert uses white chocolate and cassis, with elderflower-infused strawberries. After all the burn and heat of the Asian BBQ, the dessert complemented the whole dinner experience excellently. 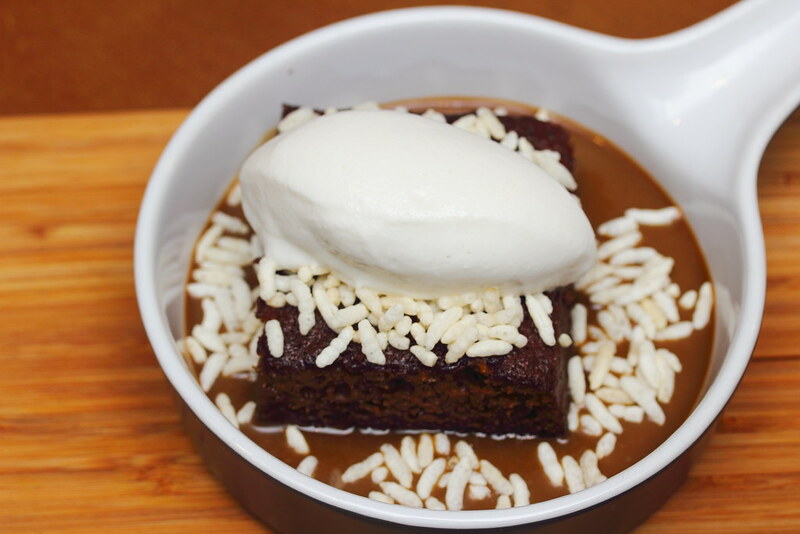 The warm Banana Bread in Brandy Butterscotch Sauce ($14) is really comforting. The moist banana bread together with the brandy butterscotch sauce is not overly sweet and well balance. The crispy rice grains provided the extra crisp to the whole dimension. The Apple Tarte Tatin ($14) is an accidental creation. Chef over caramalized the apples for his traditional apple pie and to save it, he laid a layer of pastry over the apples, baking it as an upside down tart. Likewise, he also created a new flavour when he burned the base of the vanilla ice cream. 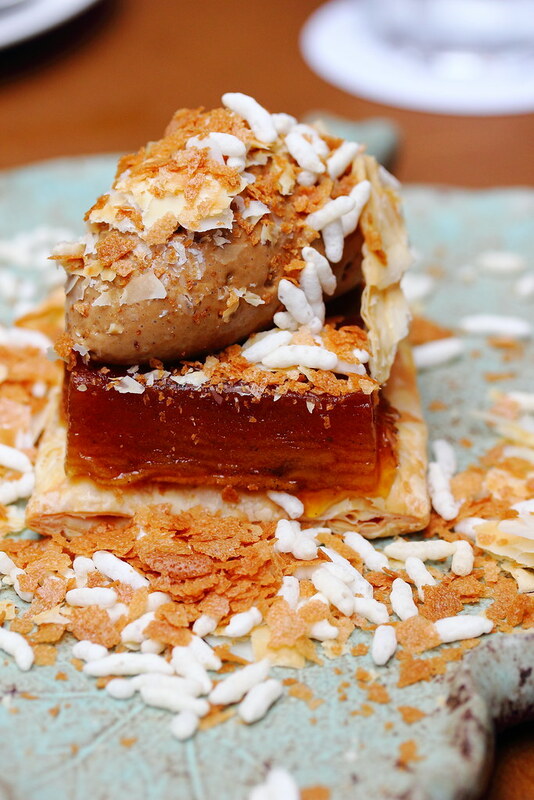 Inspired by Chef Song's favourite childhood food, peanut butter and jam, he created the Childhood ($16) which looks like someone has dropped the ice cream on the plate. 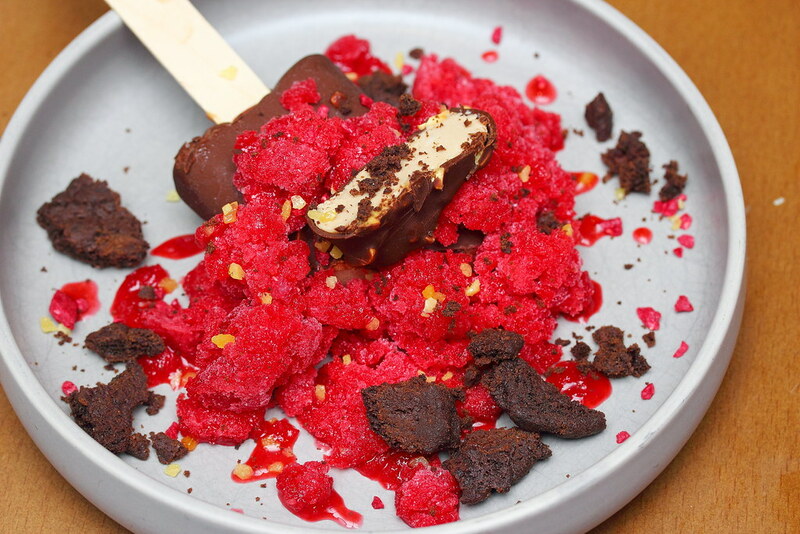 What is on the plate is actually a peanut butter popsicle with dark chocolate cookie and raspberry granita. Fat LuLu's Asian BBQ & Dessert is quite an interesting new concept bring two contrasting chefs together. The difference created magical in the kitchen instead. Not only their styles complement each other but diners get to have the must of both worlds. Fat Lulu's serves brunch on weekends too.